Imagine a world where only the four most-populated cities in the United States were allowed to vote. This would mean that of the current 326.8 million people living in the United States, only 17.6 million would have their voice heard. This comes out to only 5.4% of the population representing the entire United States’ views. For years, this has been the case for many marketing agencies and the businesses who hire them. Highly populated cities have been major hubs for businesses to seek the best marketing agency talent. Using major metropolitan agencies, however, shifts the perspective of marketing tactics to a large city lens, curating experiences that may not speak to crucial demographics of lower populated areas. While major cities are an important component to our melting pot, America is made up of all kinds of villages, towns, hamlets, and cities that span the entire nation. Local and regional businesses looking to a large agency to handle all marketing may seem like the right thing to do but finding an agency that understands the full perspective of your target demographic audiences may lead you closer to home than you expect. The key question driving marketing strategy for any business has always been whether or not you are effectively reaching the correct target audience. Effectively reaching audiences is not about how big or flashy your campaign is, it is about how tailored your content experience is to the audiences most relevant to your product or service. Determining relevance lies in truly understanding audience perspective – how they exist, operate, and perceive the world around them. This perspective can change drastically as population, age, region, and culture are considered. Marketing agencies in larger cities are driven by employees that live in big cities. Their perception is based on the speed, nature, and culture of large city life which may exclude the perception of those living in areas that are not so congested. This is not to say that big-city agencies do not offer great work, but merely operate through a different lens. While these firms may offer competitive rates for nationwide or international business, their scope may be too large for the small to mid-size businesses that truly drive local markets. Most Americans do not live in densely populated cities such as New York and Los Angeles and neither do their small businesses. Rather, they live in quieter cities and towns not unlike Hartland, WI – home to Ocreative. Marketing agencies located in smaller cities and towns have employees with local perspective which can offer better insights on the population most likely to purchase a local businesses’ product or service. The relationship between local businesses and local agencies can be powerful and magnetic for consumers near and far. Small to mid-size businesses can use the marketing expertise of local agencies to push their product to larger markets while maintaining market share right in their own communities. 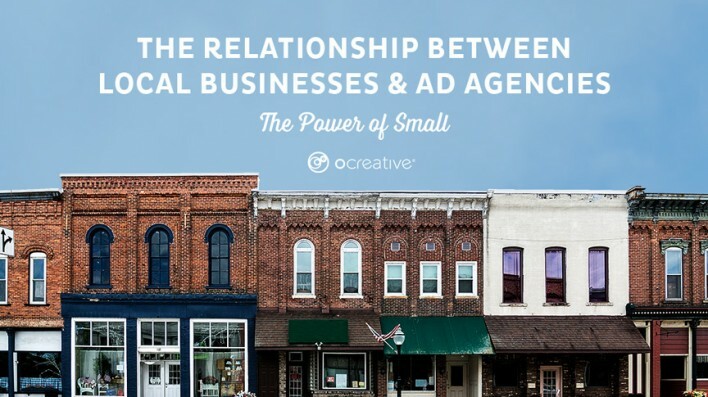 Not to mention, local ad agencies work in areas with an overall lower cost of living which translates to better service rates for small and mid-size businesses. The truth is, small businesses matter and using smaller agencies reduces overhead. “The more people that work for a company, the bigger the overhead, ultimately resulting in higher project quotes than those from smaller marketing agencies. Smaller agencies also provide a much better bang for your buck.” (IDEAMKTG) The value not only lies in the cost, but also includes an incredible level of flexibility and creativity as fewer people are working on projects allowing clients access to the talent working on their strategy. Larger agencies have dedicated client service teams of account managers who work with the client and relay their information and needs to other teams like design and digital. Those teams, in turn, follow action items and provide their materials to the account manager which then relays it back to the client. Smaller agencies cut out the middleman. Businesses marketing to nation-wide or international audiences have diverse networks of specific departments and a work culture acclimated to multi-departmental operations which line up with client service style agency structures, but small businesses are used to working person-to-person. Neither is better than the other, they are just different. It is important to find an agency that fits with your workflow. And it’s not just small businesses that win. Recently, AdWeek noted a major trend in talented and experienced marketing professionals seeking employment at smaller agencies to improve their personal well-being and work/life balance. Notably, AdWeek points out that these marketing professionals are fanning out to smaller cities with the same “cultural access points and professional opportunities as a larger city”. Leann Leahy, CEO of The VIA Agency (Portland, ME), previously working in New York, is a great example of this, “It was eye-opening, the opportunities that can be afforded, balanced with the lifestyle of Maine…My career challenges are as good as, if not greater, than they’ve ever been in my career, and yet I have a 15-minute commute and live by the ocean” (AdWeek). It just makes sense – happier work environments make for happier employees. Happier employees produce amazing work. At the end of the day, small agencies have the same talent, technology and access to information as big-city agencies, but with crucial insight into local perception and culture. Small agencies build strong partnerships with their clients based on direct accessibility and flexibility throughout the creative process and the campaign as a whole. Don’t let their size fool you, like any small business, it just takes a few dedicated and talented people to make major waves. Oster, E. (2018, September 3). Bright Lights, Small Cities. ADWEEK, LIX(22), 8-8.